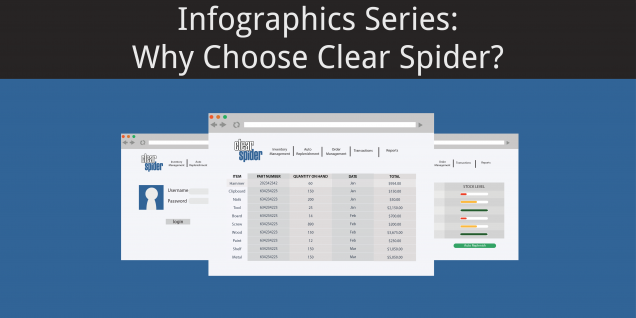 Infographics Series: Why Choose Clear Spider? As a role-based system, users are shown only the functions they need. Having a straightforward process makes it easier for each user. Also, the intuitive system is user-friendly, which makes training easy. Just because you have complex inventory processes doesn’t mean you need a complex system. Speaking of complexity, the system can be as complex or simple as you need. Whether you just need part numbers or if you need to track shelf life and batch numbers, Clear Spider can do it all. As a flexible system, Clear Spider can mold to your needs. So, you will have a scalable system that can also adjust to future needs and growth. Since Clear Spider can integrate with other systems you’re using, you don’t need to rekey data. This can save you time and money, as you won’t need to manually transfer between systems. This can also minimize the risk of entering bad data. No matter where you view from, you will have the most up-to-date data. If you choose Clear Spider, you can view reports and analytics. These can add valuable insights when making key decisions. Compare month-to-month and year-over-year data. Reviewing the right reports can make sure you’re maximizing your savings. With Clear Spider, you can have as many users as you need. From suppliers to customers, everybody will be on the same page. As a supplier, you can allow customers to see which items are in stock. As a customer, you can provide suppliers with visibility into your levels. Since Clear Spider is cloud-based with mobile access, you can take it on-the-go. Available on phones, tablets, and scanners, you can manage inventory anywhere at any time. Also, the app also allows you to work offline if you’re somewhere without connection. The system will alert you when you need more product, saving time. With automatic replenishment, you can pre-set min, max, and reorder points. The system can create purchase orders for when stock nears these points. Picking the right algorithm can minimize costs. On your end, Clear Spider requires little effort. There’s nothing for you to build or maintain. You don’t need to purchase or install hardware or software. Since Clear Spider does everything for you, the process is easy. So, why choose Clear Spider? The system can be easily tailored to fit your needs. As a scalable system, it can adapt to changes and requires little effort on your end. With time and money-saving processes, Clear Spider can increase efficiency and ROI. As we conclude this series, you can see important inventory management is. Interested in taking the next step? Click here to schedule a demo.